So Many Creative Wellness Resources in Wellsville, NY and surrounding areas of Allegany County NY! 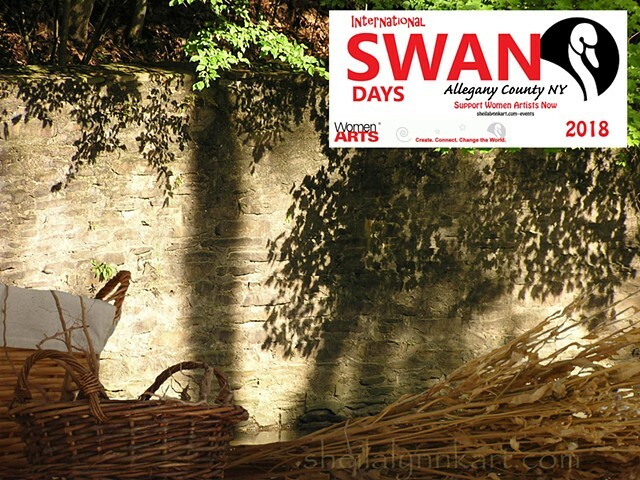 SWAN Days Allegany County NY provides an opportunity for local artists and entrepreneurs to come together to promote our creative and natural resources under one united event. WHAT DO YOU ADD TO THE BASKET? Allegany County NY Resources and Local Businesses. Founded at WomenArts.org and now in its 11th year, SWAN (Support Women Artists Now) Day is an annual international event to celebrate women in the arts. Launched in 2014 in partnership with the Belfast Organization for Artists; our local SWAN Day events and activities are held annually in honor of the many people who work diligently to keep the arts accessible to all members of our rural community. Please submit the attached registration form with your item(s) at SheilaLynnK Art Studio , 345 South Main Street, Wellsville, NY 14895 . Items accepted by delivery or during regular Open Studio Hours. Product Sponsors will be identified on publications and displays during SWAN Days Allegany County NY 2018 Activities. (Please specify if you would like to remain anonymous.) CONTACT the studio if you have any questions about participating in the Creative Wellness Theme Basket. AND ~ Events, presentations, classes, and workshops about all of the above. Basket to be Auctioned/Raffled during 2018 SWAN Days Activities. Recipient to be notified April 9, 2018. Proceeds Fund SWAN Day Awards and activities which support local women in the arts.